OK, so the title of this post is a little exaggerated. The show always goes on, despite what obstacles might show up and threaten to throw a major monkey wrench into your best-laid plans. However, in the days leading up to KHC’s Third Annual Conference on March 15, a major snowstorm that wreaked havoc across the Northeastern U.S. also threatened to leave the conference with almost no speakers, who were coming in from various parts of the country. On Monday morning, two days before the conference, keynote speaker François de Brantes called with the information that it looked like he was not going to be able to find a flight out of Connecticut. By the next morning, Health Tranformation Alliance’s Michael Logan was also unable to find a flight out of the Northeast. On Tuesday afternoon, two of our speakers coming in from Colorado called to say they were stuck in Chicago, where thousands of flights were canceled or delayed. After several hours, they were able to rent the last car in Chicago and drive to Louisville Tuesday evening. Again, the show must go on. 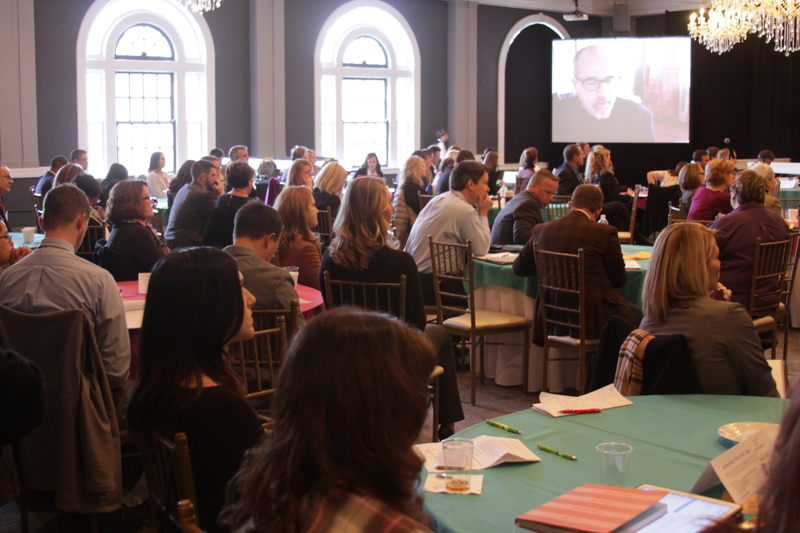 We were able to set up Skype sessions with de Brantes and Logan, so they could give their speeches remotely, and with the rest of the speakers and panelists either in town or on their way, the KHC 2017 Conference began. The event kicked off Tuesday evening with a reception at The Seelbach hotel, in the historic Rathskeller Room. Kentucky Cabinet for Health and Family Services Secretary Vickie Yates Brown Glisson gave some brief remarks to attendees. At Wednesday’s conference, attendees heard from a variety of speakers about measurement, data, and payment innovation; cultural competency; and the game changers that could be in store over the next few years. Dr. Steve Berkowitz kicked off the morning with an energizing discussion about how transparency and consumerism are shaping new changes in healthcare and how healthcare can learn from the successes of other industries that have achieved success without bricks and mortar. The morning also contained several discussions about measurement alignment and transparency. Jonathan Mathieu with Colorado’s all payers claims database (APCD), Center for Improving Value in Health Care (CIVHC), shared how his state was able to build, sustain and effectively utilize their APCD to drive improved health, enhanced quality and lower costs. Conference attendees listen to keynote speaker François de Brantes speak about APMs. De Brantes reviewed the current state of deployment of Alternative Payment Models (APMs). Connecting remotely through Skype, he talked about the important lessons learned in implementing APMs, the critical role that market forces can play when used to improve the quality and affordability of health care and how private sector employers can accelerate the pace of change in the industry. He then joined Humana’s Misty Roberts and NRHI’s Ellen Gagnon on a panel that discussed how communities and organizations begin to get to more meaningful measurement for consumers while balancing the measurement burden to providers. Logan kicked off the afternoon with a review of HTA’s bold and aggressive plans. With more than 30 of America’s largest corporations, HTA plans to find a better way of providing healthcare to their employees to create better health care outcomes and reduce waste. 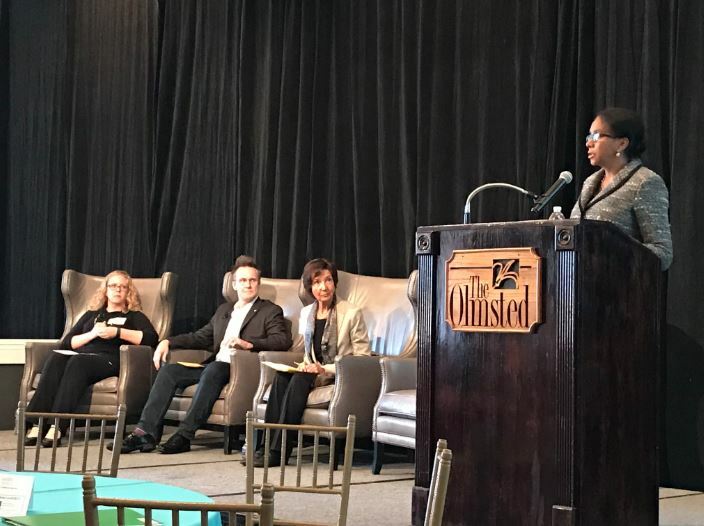 KentuckyOne’s Dr. Stephanie Mayfield Gibson leads the social determinants of health panel discussion. We wrapped up the afternoon with a presentation and a panel about social determinants of health, an important aspect of health outcomes that was new for a KHC Conference. Robin DiMatteo, PhD, Distinguished Emerita Professor of Psychology, Univ. of CA, Riverside, discussed essential elements of healthcare delivery including effective communication, improvement of the healthcare experience, consumer empowerment, engagement, shared decision making, cultural humility and attention to health literacy. She then was joined by Kristin Paulson, Director of Health Care Programs for CIVHC, Colorado’s APCD, and IDEAS xLab co-founder Theo Edmunds for a panel discussion about the challenges that healthcare systems and the community face when they address the socioeconomic factors that impede individuals from reaching their fullest potential. Thank you to all of the staff, speakers, panelists, exhibitors and attendees for making this year’s conference a success. A special thanks goes to Norton Healthcare for their Gold sponsorship and Delta Dental for their silver sponsorship. Be sure to save the date for our Fourth Annual KHC Conference on March 14, 2018!